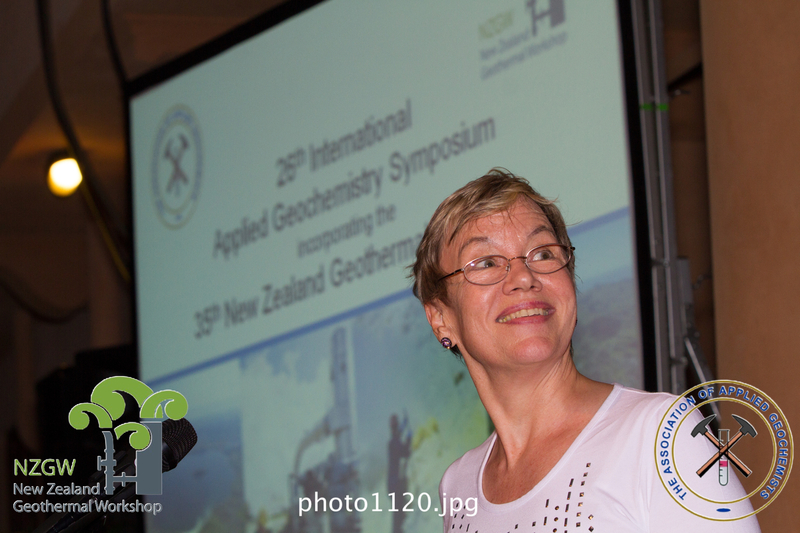 The AAG awarded the Silver Medal to Gwendy Hall at the 26th International Applied Geochemistry Symposium in Rotorua, New Zealand. Citation given by Paul Morris in November 2013, New Zealand. It gives me great pleasure to ask Gwendy Hall to come up and receive the AAG Silver Medal for dedicated service to the Association. At this stage, I would like to thank the other members of the Awards and Medals Committee – Chris Benn, Eion Cameron, and Pertti Sarala – for their input to this award. I can tell a small story which I think encapsulates what Gwendy Hall is to AAG, and although I suspect the story might embarrass Bob Eppinger as well as myself, I shall tell it in any case. On arriving in Rotorua, I realised that I had not done anything about the actual medals to be presented tonight, and on questioning Bob, it appeared that he had also not done anything. He strung me along for a while, and then let me know that Gwendy had organised the medals and their engraving and brought the medals to New Zealand. This is quite typical of Gwendy, in covering the backs of the rest of us. In looking around the members gathered here, I can see many who have belonged to AAG for a number of years, as well as those who have been office bearers. However, I would suggest that few – if any – have held as many offices in the association for as protracted a time period as Gwendy Hall; vice president, president, councillor, treasurer (1996-), committee member, and journal editor, the latter which I will talk about in the following. Quite a few of us here have been office bearers in AAG, and all of us have benefitted from having Gwendy Hall in the association. A source of wisdom and knowledge, of wise counsel, and always putting the good of the association and its membership first. About eight years ago, AAG faced a crisis with Journal of Geochemical Exploration, in that Elsevier wanted to renegotiate its arrangements with AAG, which would have been to our disadvantage. With Gwendy leading the discussion, it was agreed to sever ties with Elsevier and create Geochemistry: Exploration, Environment, Analysis, a difficult challenge. Thus GEEA came into being, which is really Gwendy’s journal, and she is and remains its only editor. Although AAG’s silver medal does not take into account scientific achievement, it is important to realise that Gwendy’s voluntary work for AAG over many years in many capacities has been undertaken in parallel with a distinguished and prolific scientific career. For anyone who has used an ICP, or used ICP data, you would have read a Gwendy Hall paper. In conclusion, I reiterate a comment made by one of the nominators for Gwendy’s silver medal, that the award is not only deserved but long overdue.